Once per turn, Bao San Niang can show any number of hand cards and choose a male character. The target much then exchange these cards for his own hand cards that are the same suit or he is damaged one by Bao San Niang. Once per turn, Bao San Niang can force all the male characters with at least one hand card to compete. The person that is the highest recovers one health. The person who is the least loses one health. If there is a tie, the later player in the tie is higher. The target of "Marriage" must exchange all of the cards put forth by Bao San Niang or take the damage. When Bao San Niang uses "Engagement", all the men with a hand must put in a card all at once. If there is a tie for either the largest or smallest, the earlier entries are counted as smaller and later entries as larger. 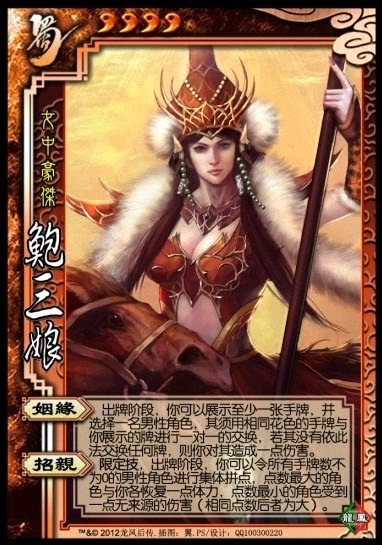 The competition cards are flipped in order starting to the right of Bao San Niang (since it would be her turn). Even though they are flipped in this order, all the men must choose their cards before any are revealed.